Is Renewal Right For You? Designing a pantry can seem pretty straightforward until you get it completed and realize that you can’t open the door. Yes, it has happened, and no, it was not a pretty sight! We don’t want you to have these same issues after your new pantry is installed, so we thought that we would come up with a list of questions that you should ask yourself. Which way do I want my door to open? As we said above, this is a very important question to ask. After all, if you want it to open in the pantry, you are not going to want to install shelves or counters that will block the door from opening. We like to solve this issue by installing sliding doors so that you don’t even need to give this a second thought! Will I have enough light? You may think that you will have enough light inside your pantry with the light from your kitchen, but have you considered how dark it can be later in the day or early in the morning? You may want to consider adding some light in there just in case because you can never have too much light. The worse case scenario is that you will never use it, but we bet you will. How will I reach the items on the top shelves? You may be young and spry now, but as you get older you won’t be able to jump up to reach everything on those top shelves. And your tall spouse might not be home every time you need something either. A small step stool can be tucked into a corner in smaller pantries, or a ladder on a sliding rail can be installed in larger ones. How should I arrange my shelves? We always recommend arranging your shelves so that the items that you use the most are easily accessible. After that, we suggest placing like items together. You will want to make sure that your shelves are not too deep so that you can see everything that is in your pantry. These are the basic questions that you should ask before designing your pantry space. There are others and your contractor can help you with those as you are going through the process. Your goal should be to make this space easy for you to use, so that you enjoy being in your kitchen as you cook and entertain family and friends. 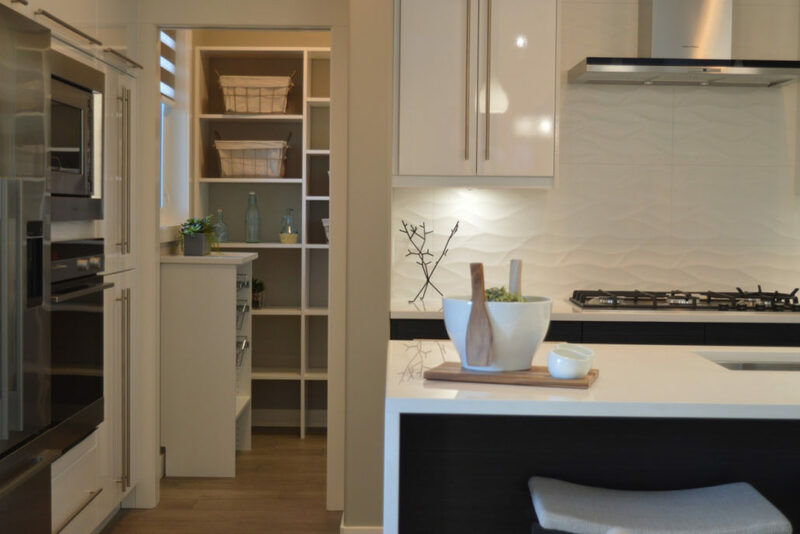 Call us at 404-378-6962 if you’re in the greater Atlanta area and would like to schedule a kitchen design appointment with one of our award-winning designers. We are proud to be an Atlanta Top Five Residential Remodeler serving intown Atlanta, Ansley Park, Avondale Estates, Candler Park, Decatur, Druid Hills, Inman Park, Toco Hill, Buckhead, Brookhaven, Sandy Springs, Dunwoody, and Chastain. Since 2001 we have completed hundreds of home remodeling projects and earned more than 50 awards for design, craftsmanship and customer service.